Salmon farming has always had that Sorcerer’s Apprentice, if-you-play-with-Mother-Nature-no-good-will-come-of-it, feel. And now that fish farms are suspected of spreading lethal infectious salmon anemia to wild salmon off the coast of British Columbia there are calls to move salmon farms inland (where they would likely impact the inland ecosystem), or simply ban them altogether. “Aquaculture of carnivores is hopeless and extremely wasteful,” said Dr. Pauly, who supports such a ban. 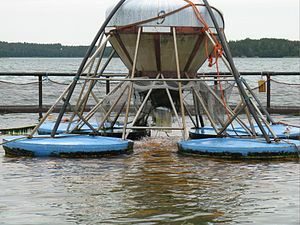 The farmed fish are fed with species that people could consume, he said, so it ends up contributing to human demand for the wild stocks of other species. For every pound of salmon produced, five pounds of wild fish are needed, usually in the form of anchovies, sardines, or mackerel. “It’s like feeding tigers a ton of livestock to get tiger meat,” says Alex Muñoz Wilson, the vice president in Chile for the nonprofit ocean conservation group Oceana. Many of these feed fish are species that people could eat, Mr. Muñoz said. A decade ago in Chile, the annual mackerel catch was around four million tons, he said. Today, only about 200,000 tons are harvested annually, he said, although the salmon farms are only partly responsible. “I think in the long run, salmon aquaculture creates more problems than benefits,” Mr. Muñoz said. Salmon is a food fetishist’s fish (yes, it tastes great and is good for you), and humans are either depleting wild stocks, or threatening them with industrial farming practices, to gorge on it. It’s a perfect example of a cultural habit whose true costs are not paid by consumers. And an example of how human desires and industry relentlessly impact and overwhelm ecosystems around the globe. But, hey, who cares? We gotta eat salmon. Thanks for bringing this to your readers. I live on San Juan Island and try to help educate visitors about the salmon.